Window lintel is one of the most important aspects in construction as it is load bearing component. Water infiltration, leakage or moisturizer spot on window either above or below in your own house, office, condos, industrial or commercial building is the evidence of poor window lintel and window still installation which need to cure immediately to avoid costly repairs. One must need an expert professional to handle Window lintel job to make sure proper construction and installation. Because incorrect placement of window lintel may cause major problems in structure on building and home. Tetra Contraction has been providing a fast and efficient remedial service for building defects caused by missing or faulty lintels. 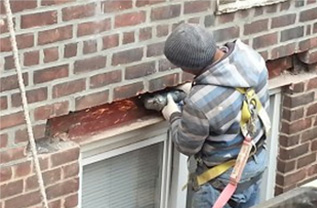 Tetra Contraction has wide experience of dealing with such problems and provides you a smooth and efficient service covering all aspects of masonry construction from window lintel replacement, window sill repair, brickwork support, parapet wall and more. Fitting of new lintel is generally required if brickwork disturbance is apparent above an opening. This process provides a solid long-term solution that could reasonably be expected to last the lifetime of the building. We also offer reliable solution for window sill to keep water away from rot. Making sure that window sill perfectly fit with frames to avert moisture and rain water penetration. However in order to meet to new standard of building safety some brickwork support is also designed to improve strength and longevity. As a leading window lintels and window sill contractor in New York City & Tri- State Area we cover Manhattan, Brooklyn, Queens, Bronx and Staten Island offering quality, style and consistency in state-of- art technologies and skills that you deserve. Give us call to get start your project with Tetra Construction and save your significant investment.